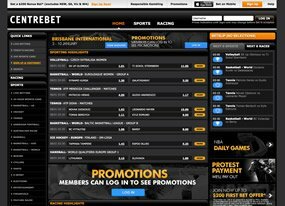 Established in 1992 by Terry Lillis in the Northern Territory of Australia, Centrebet has grown and become one of the most reputable online sportsbooks in the country. Centerbet retains deep roots in the online betting industry that date back to 1996 when they became the first licensed bookmaker in the Southern Hemisphere. After being sold various times to different buyers, Centrebet finally settled down when William Hill acquired them in 2013. Boasting a great showing of Australian sports, Centrebet does not limit their sports betting options to their native sports. They offer most – if not all, international sports such as MLB, NHL and UFC as well. They specialize in their trademark ‘Pick Your Own’ markets, where bettors are able to pick their own line or match, which enables them to pick a line and price that best suits their needs. These features are available for the Australian Football League and National Rugby League only. Centrebet offers sign up bonuses of up to $200 upon completion of bettor’s first wagers. They will match the stake of the bettor’s first wager up to $200. Their terms and conditions require bettors with winning bonus bets to turn over the proceeds from said bets at least once to be able to withdraw funds from their account. Centrebet also offers a referral bonus of $50 when you refer a friend to the sportsbook. The main limitation on this offer is that it excludes New South Wales, Victoria, South Australia and West Australia. Australia’s Northern Territory, where Centrebet is licensed, is known for having one of the world’s most firmly regulated gaming environments. Their strict betting rules and restrictions on the types of wagers that can be made allows for a very safe and trusted betting environment. Staying ahead of the game with a mobile app allows Centrebet to rank higher amongst other sportsbooks. Most bettors are placing bets on their mobile devices and some websites are not mobile-friendly and can be quite difficult to navigate. A mobile app allows for an easy-to-use interface for live betting and Centrebet’s application is a breeze to use.